If you’re a fan of wildlife and you’re a thrill seeker, you will definitely put this hotel on your to-visit list. The Jamala Wildlife Lodge is one of the most extraordinary accommodations for tourists and locals in Canberra, Australia. Richard Tindale and his family own the hotel, which offers its guests a stay they will never forget. The hotel has a total of 20 luxurious suites divided into 3 sections – the Giraffe Treehouses, the Jungle Bungalows and the Shaka Lodge. The Giraffe Treehouses let you spend an afternoon feeding giraffes from your terrace, the Shaka Lodge offers a variety of animals, from sharks to monkeys, while the Jungle Bungalows are for the bravest of customers – they’ve got bears, lions and tons of other carnivorous animals. 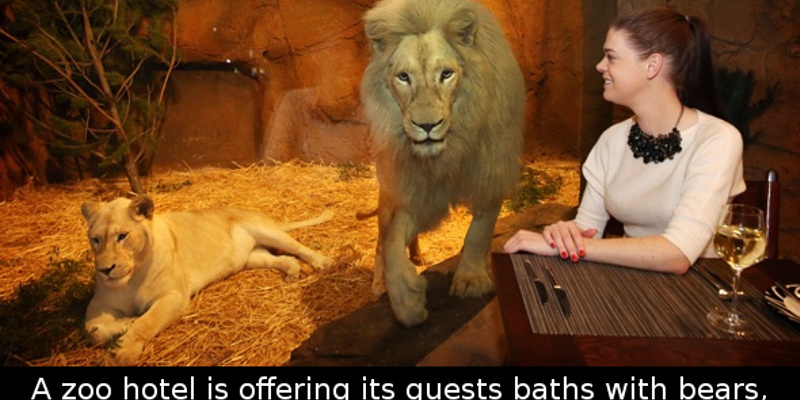 The hotel’s guests can lunch with the lions or take a bath next to the bears. The suits are separated from the animals’ enclosures only by thick glass walls, so they can trick the mind into believing you’re living in with a dangerous wild animal. 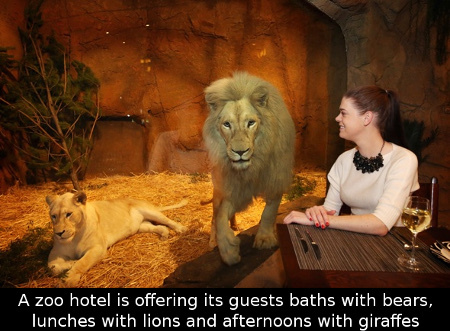 The owner claims that the idea of the hotel is to let its guests feel as one with nature as possible.